My mom surprised me with this quilt back in November last year at the annual craft fair that she and I run a booth at. She's the crafy one, I just help carry the things she has made, display and sell them. We were unpacking the quilts to hang on the quilt rack. This rack has three rungs and is about 8 feet wide. So I hang on the bottom rung first, then middle then top so they all lay correctly. As I start hanging, she pulls more quilts out and hands me one with purple backing. I set it down because it was purple and I wanted it on the top rung since purple is my favorite color. So I finally get to the top rung of the rack and reach for this quilt which is still neatly folded on the table. I unfold it so I can refold it for display and I'm looking at the back of it - I didn't realize it was mine until I finished folding and flipped it around to hang it. I squealed loudly with glee, then I hugged it tight and said, "THIS ONE IS MINE!!!!" And then, still clinging onto the quilt, I hugged her even tighter. I held it out to admire it some more and then realized that I had just put my mom through such suspense waiting for my reaction so we had a good laugh about that. The technique she used, I think, is called free-motion and is in a loopy pattern. She did it all on her Pfaff sewing machine. And shame on me for this, but I can't remember whether she made the pattern for the blocks herself, but I bet my savings that she did. She's crafty like that! She also did not prewash the fabric so that I could have that beautiful crinkled effect that I love so much about quilts. My mom also made this little beauty! 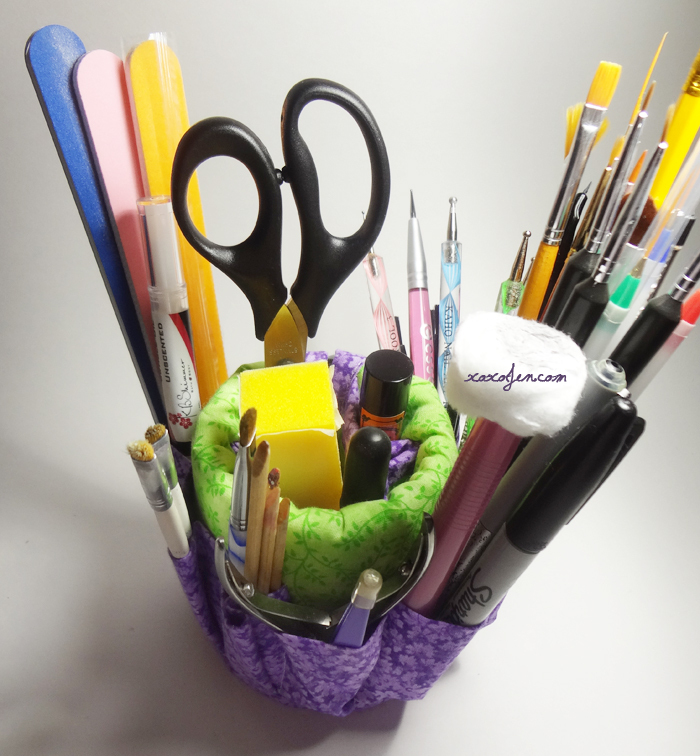 It is my nail tool and 'stuff' organizer. Can you believe all this stuff fits in a standard sized coffee mug? The holder just wraps around the mug and velcros under the handle. There are heaps of pockets on the inside and outside to hold all the things! It's so handy to have everything in my reach without taking up a lot of desk space or having to open a drawer with wet nails. And finally, something that I made! I went to quilt retreat with mom in July last year. It was my first time going and I had a great time, made some new friends and learned a LOT of stuff. I made two of these and really enjoyed doing it! 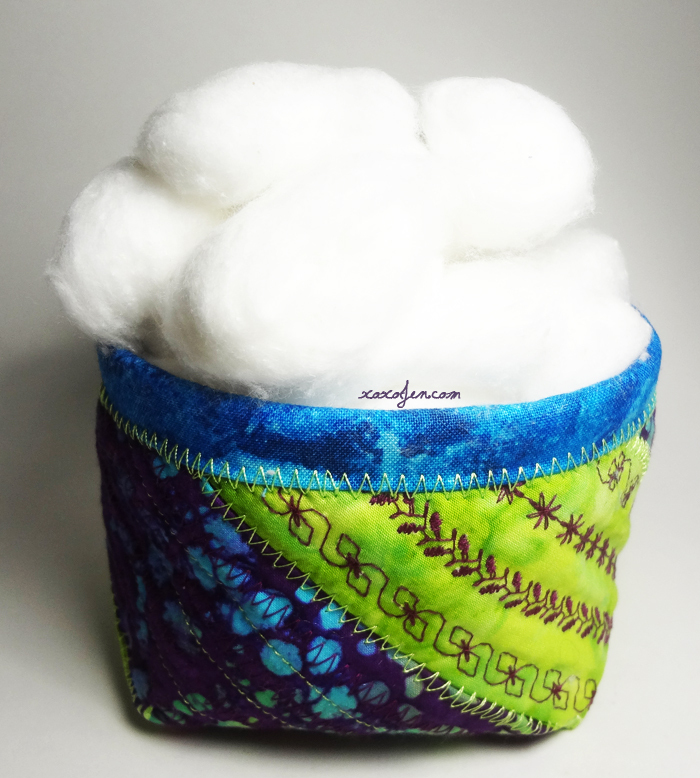 It's the perfect size for cotton balls or felt and foil(that's what's in the other one!). 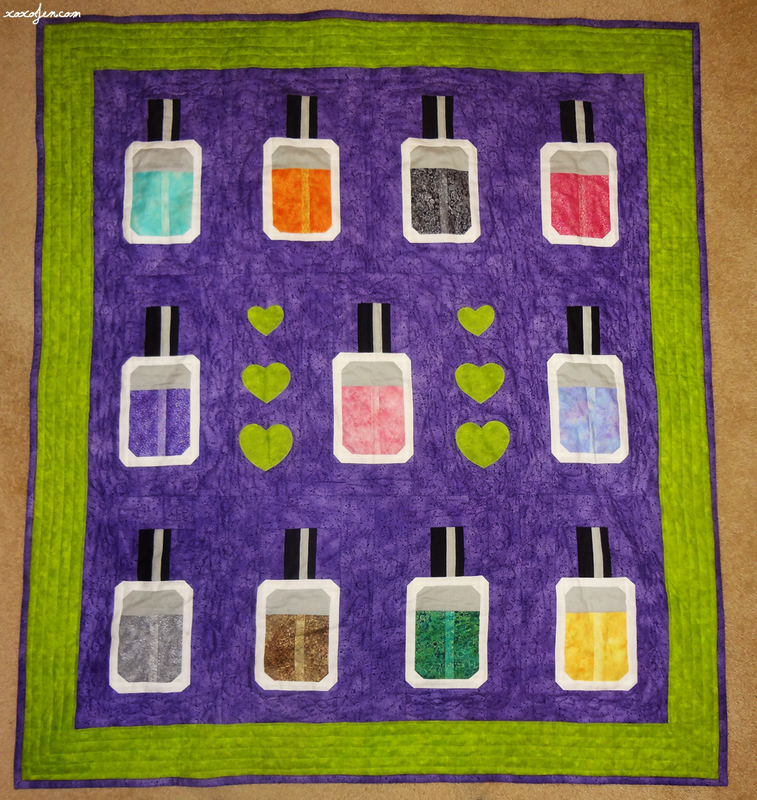 That quilt is too cute and great organization too! Omgosh, that quilt is great! I wish I was crafty enough to make own for myself! My grandma used to make quilts and things all of the time but I never picked up on how to do it myself! Eeeppp this too cute for words! Your Mom is one talented lady! <3 She absolutely is! Thank you Jenna!